One of the most familiar battle cries of the Tories and their cheerleaders in the right-wing corporate press is the claim that anyone who opposes Tory policies is guilty of "class warfare". I've already written an article about how so many Tories seem to be stuck in the class warfare battles of the 1970s so I won't go into that in so much detail. In this article I'm going to present some facts and analysis to support the argument that if anyone is guilty of conducting "class warfare" then it's clearly the Tories. Research conducted by Sheffield Hallam University has conclusively shown that the worst impact of Tory so-called "welfare reform" has been imposed on predominantly Labour voting areas like the north east, north west, south Wales and parts of Greater London. Meanwhile the majority of the least affected areas happen to be in the Tory strongholds of the Home Counties and the rural north. When we look at the severity of cuts to local council budgets a very similar pattern emerges. Predominantly Labour voting areas have borne the heaviest cuts in local government spending, while Tory councils have generally got off much more lightly. Even though Tory councils have suffered nothing like the severity of budget cuts endured by places like Newcastle, that didn't stop David Cameron's own mother and aunt from lambasting the devastating effects of his ideological austerity agenda on local services, and neither did it stop Cameron himself from writing a bizarrely hypocritical letter to the leader of Oxfordshire County Council to complain about the service cuts they have been forced to make as a result of the Tory central government's obsession with ideological austerity. Even though the bulk of local government austerity has been inflicted on poorer Labour voting areas, the Tory response to the furore over local government cuts by Tory councils and Tory MPs was to announce an extra £300 million in local government funding, 83% of which will go to Tory controlled councils. When George Osborne was planning to rob the working poor by slashing their working Tax Credits (despite numerous pre-election promises that the Tories would do no such thing) he ploughed on with it for ages in the face of massive public opposition, harsh criticism from opposition MPs, criticism from his fellow Tory MPs, and a large House of Lords rebellion. Eventually George Osborne "U-turned" (by finding other ways of robbing the working poor), but he put up an epic fight to impoverish them. When it came to proposed pension reforms that would have adversely impacted the rich, George Osborne dropped them before they'd even been officially announced! The contrast couldn't be more obvious. One of the clearest examples of Tory "class war" politics came in April 2013 when they introduced "Bedroom Tax" to penalise social housing tenants from poor backgrounds whether there was a smaller property available for them to move (less than 3% of cases) into or not (over 97% of cases). In the very same week that they economically sanctioned hundreds of thousands of some of the poorest families in the UK, they handed an average £100,000 per year tax cut to Britain's 13,000 income millionaires! 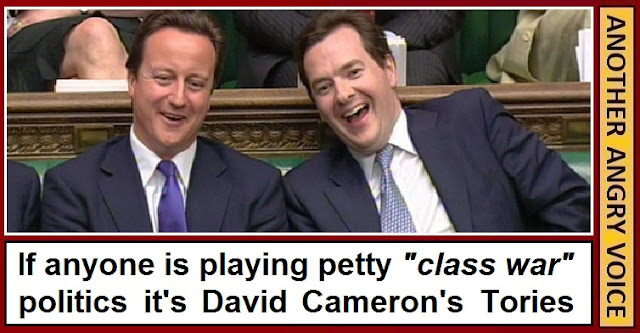 Then they've got the absolute cheek to keep telling us that "we-re all in this together"! The UK already has some of the most restrictive anti-trade union laws in the developed world, yet the Tories are pushing ahead with a plan to make trade union democracy so unworkable that taking strike action will become almost impossible. Proposed legislation to turn an abstention into a stronger vote against strike action than an actual vote against strike action can surely only have been devised as a deliberately malicious effort to render effective trade unionism almost impossible. This ongoing Tory attack on trade unionism is not the only example of Tories attacking workers' rights. Take their introduction of £1,200 fees in order to seek compensation for unfair dismissal, prolonged public sector pay freezes (which conveniently don't seem to apply to members of parliament who get one inflation busting pay raise after another) and the longest sustained decline in workers' wages since records began. On the other hand the Tories have done nothing to reform the banks after the 2007-08 financial sector insolvency crisis. In fact financial sector workers (including bankers at failed, taxpayer bailed out banks) are taking home even larger bonuses than they were before the crash, and the Tories are actively assisting the inflation of another hopelessly unsustainable property speculation bubble with house price inflation schemes like "Help to Buy". There's a legitimate debate to be had about whether the unions had too much power in the 1970s, or whether industrial decline in the UK was more a consequence of the incompetence of the over-privileged and hopelessly uncompetitive upper managerial classes and their utter failure to adopt modern managerial practices in order to compete with the Japanese, Germans and Americans. Where there is no room for debate whatever is whether the 2007-08 economic meltdown was caused by ordinary workers and trade union activity, or by a massive spree of shockingly reckless financial sector gambling and outright fraud. The fact that the Tories choose to focus their legislative efforts on attacking the trade unions and undermining workers' rights instead of trying to get the bloated, corruption riddled financial sector under control is an absolutely clear demonstration that these people are ideologically driven class warriors with no real concern for the long-term well being of the UK economy. Whichever way we turn, we see the Tories favouring rich over the poor, employers over employees, the aristocracy over the "lower orders", Tory councils over Labour ones, the privileged over the ordinary, the greedy over the needy, the 1% over the 99%. The fact that they behave like this shouldn't be any kind of shock at all to anyone who knows where the Tories get most of their financial donations, but what is shocking is the way that Tories and their supporters continue to dismiss opposition to their divisive inequality promoting policies as "class war" politics when they themselves are clearly engaging in class war; a crusade to enrich the already wealthy minority at the expense of everyone else. Why are so many Tories still fighting the ideological battles of the 1970s? How gullible would you have to be to believe the Tory "hardworking people" propaganda?